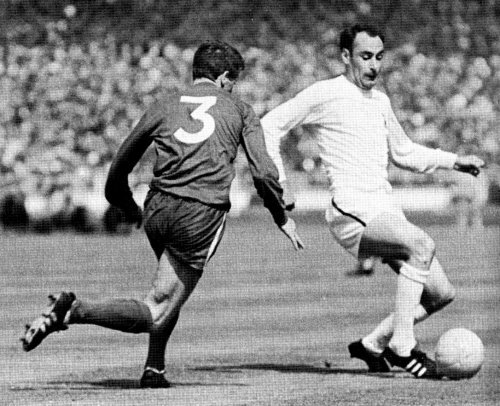 After the successful Bobby Smith - Jimmy Greaves striker partnership, Bill Nicholson needed to find a reliable partner for Jimmy and he signed Alan Gilzean from Dundee in 1964 for £72,000, which was a massive fee in those days. Gilly was already a Scottish International and had an eye for goal. Alan soon settled down well in the Spurs side and proved an ideal foil for Greaves. He could not have been more different to the swashbuckling style of his predecessor, Bobby Smith. In contrast to the all-effort and very physical aspects of Smith's game, Gilly relied on his high level of skill including deft flicks with his head and neat passes and he was a huge creator of chances as well as a natural goalscorer. His superb ability in the air made him very difficult to mark and he was adept at flicking the ball on with his head in to the path of a team-mate to score. He was superb at heading the ball in any direction and was also very neat on the ground. The G-men - Greaves and Gilzean - enjoyed a fruitful partnership for six years before Greaves moved on to West Ham. Gilly then formed another deadly strike force with Martin Chivers. Big Chiv had joined in 1967, but it was in 1970 after Jimmy had gone that the Chivers-Gilzean partnership bore fruit. Gilly played slightly behind big Chiv and his trademark back-headers from a long throw into the penalty area became a regular feature of Spurs' play at the time. Alan had a really successful career for Spurs playing until he was 36 in 1974. He won two League Cups with Spurs In 1971, against Aston Villa and in 1973 against Norwich as well as the FA Cup against Chelsea in 1967 (picture right). Gilzean always looked a lot older than he actually was as his quickly receding black hair thinned and he became a familiar sight as a balding striker. Where Gilly really excelled was against continental opposition in Europe competitions, because the European sides were not able to counter his aerial ability and they were unused to it. Alan had a superb goalscoring record in Europe averaging a goal every two games scoring 13 goals in 27 starts. He was magnificent in the UEFA Cup win in 1972 and was hugely effective throughout the campaign when his flicks helped Chivers to score goals as well as heading on the latter's huge throw-ins so that the pair became a real menace to all defenders. In his ten years at Spurs Gilly made so many goals for others that his contribution was immense. His goalscoring record is impressive too, scoring 93 League goals for Spurs in 335 starts, almost a goal every three games and he was always the man for the big occasion. He revelled in the atmosphere of big Cup games and was a familiar figure leaping to flick on corners and set pieces. Alan scored 21 goals in the FA Cup from 40 games which shows just how he rose to the big occasion and the tension of Cup ties. Gilly is one of a select few father and son combinations that have played for Spurs, because his son Ian later played for Spurs and Dundee. Gilly was the son of a painter and decorator and he is best remembered at the Lane as a ball-artist ... brilliant in the air, brave and a real team player. He has had no equal in his aerial ability and he remains a Spurs legend. His flicks, his awareness, his positioning and his skill were outstanding. Gilzean was the king of White Hart Lane.